Tonight, on their third night in the coop, two of the three chicks walked up the ramp and into the hen house all on their own! Once the birds saw Matt and I walking toward them, Gigi immediately flew up on the ramp and went right in. Nellie and Loretta weren’t as sure about this bedtime business, and hid under the hen house. I knelt down (no easy feat!) and managed to get Nellie into my hands. She went in without a fight. But Loretta had other ideas. After trying to woo her for several minutes, I went back outside, and watched as Matt rewarded Gigi and Nellie with dried meal worms for making it to their bedroom. Then I heard Loretta’s wings start to flap. She flew up on the ramp, and quickly scuttled through the hen house door to join her sisters. 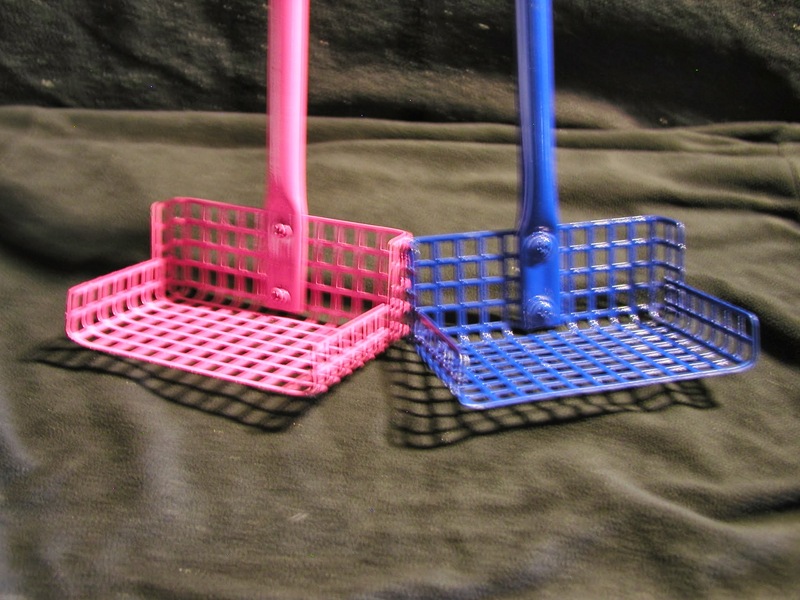 A closeup of the Stand-n-Scoop. As we were closing up I noticed the bird droppings in the sand. Not a lot, but I saw them, and wished for an easy way to clean them up. Right now I have a heavy duty kitty littler scoop that I use to sift the sand. But it requires me to bend over. Deep. (Uuugh!) And the run is 5 feet by 10 feet wide. That’s a lot of space to scoop for poop! I thought of modifying a rake with wire mesh. I considered duct taping a litter scoop to a broom handle. And then I discovered The Stand-n-Scoop! It’s basically a sifting scooper with openings the size of wire mesh. With a LONG handle, so I don’t have to squat down and wonder how I’ll ever get up again. Awesome. I’m pretty much sure it was the best $35 I ever spent. Stay tuned. Before long, I’ll be doing the poop scoop boogie! BONUS VIDEO: Here’s the official Stand-n-Scoop promotional video. That’s a great find! I’m all about finding things to prevent me from squatting and bending down. Getting to old and fat for that ! Amen to that! Last night I crouched down in the coop and almost had to crawl out. Oh my!